The story goes that Essex came into being after a tire went flat and there was no where within miles and miles to have it fixed. Bell's Towing and Cafe sprang up, a post office was built, and the town survives today in its own unique fashion. Essex, California, lies on Old National Trails Highway, part of the old Route 66, just south of Interstate 40 in the Mojave Desert. 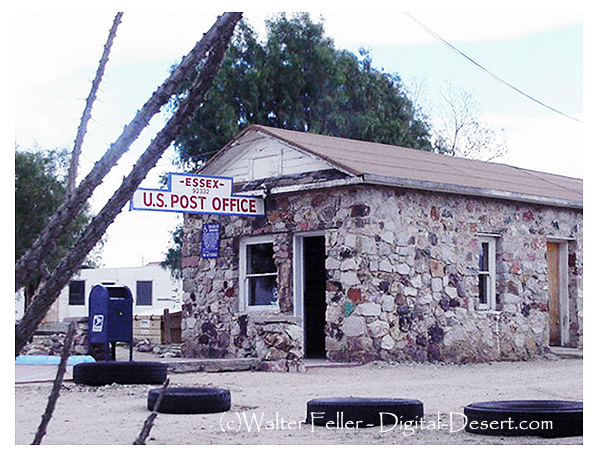 With an estimated population of just 89 people in 2005, Essex is on the verge of becoming one of many ghost towns scattered throughout the Southwestern United States displaced by the creation of Interstate 40. Essex Elementary school (founded 1937), which once served the educational needs of both Essex and its neighbor Goffs is currently closed. Its location remote even with today's technological capabilities, Essex lacks many comforts of modern day life, and in 1977, Essex got television for the first time. To commemorate this, the entire population of the town attended a taping of The Tonight Show Starring Johnny Carson. Essex was notable along route 66 for provide free water to travelers, thanks to a well installed by the Automobile Club of Southern California. Over a dozen homes also serviced the small community. Many of the homes and buildings in Essex have completely disappeared, almost 50 lie in abandonment, and of what was once a bustling roadside hub, only the singly-employed post office, and Caltrans maintenance yard are operational. Three miles northeast of Essex, just north of Goffs Road, the remains of Camp Essex Army Airfield are still visible.